The people from Redbubble offered us the opportunity to review some of their products and we took up the offer. The review below is ours and not influenced by Redbubble. They supplied us with free merchandise but all opinions are our own. Redbubble gave us a $50 gift card to order anything from their website. They didn’t care what we got so we went shopping. Shopping on the Redbubble website is fun, but there’s so much amazing stuff that it’s hard to choose! After a couple of hours going through hundreds of products, we ended up ordering a t-shirt, stickers, and greeting cards. The picture above is everything we got for $50 (including shipping). Now let’s look at the items. Redbubble prints their designs on American Apparel t-shirts and that means no cheap shirt that will look horrible after one wash. There are a couple styles to choose from for both man and women. We got a women’s shirt, the organic version, as you can get organic for no extra cost. Normal shirts come in more than 20 colors but the organic one comes in just 4 colors. The color we chose was natural (a cream color) and the color works great with the graphics. The first image of this review shows the real color of the shirt. 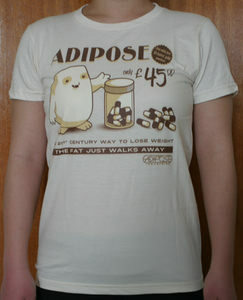 Of course the Adipose will be a hit with Doctor Who fans and the design is nicely printed on the shirt. It’s hard to see but the picture is not one big blob of paint that feels hard on the shirt. There is plenty of fabric around the pictures and words, which makes the shirt a lot more comfortable to wear. 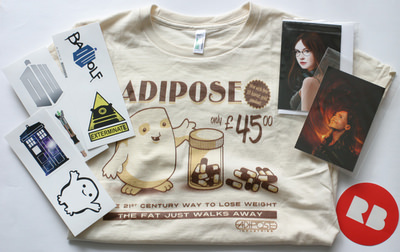 The Adipose t-shirt feels soft and came with a clothespin with washing instructions. The tag says that the shirt is made in America by people in matching socks. And the last line on the washing instructions says “Don’t slap pandas”, which I normally don’t do when I wash my clothes. Only time will tell how this t-shirt will hold but I am very confident as it is made by American Apparel and the design feels really solid, not something that will come off easily. I got a postcard and a greeting card from two of the latest companions of the Doctor, Amy Pond and Clara Oswald. Each card came in a plastic sleeve so that it doesn’t get damaged and I was surprised because I didn’t check the plastic sleeve option. I guess maybe it is because I only got 2 cards instead of a bulk shipment. Maybe you remember the picture of Clara – we wrote about it as a Clara Oswald Poster. I really liked the design so I decided to get a postcard of it. The postcard of Clara is great quality and the picture really looks amazing. And I will frame this one as I don’t have room for a big poster. On the back of the card there are the usual things like a stamp area and lines for the address. The card of Clara is 10 x 15 cm (4 x 6 inch). Of course I chose two cards with dark backgrounds and pictures don’t do them justice, so click on the picture of the cards above to see a more realistic picture. The greeting card of Amy looks stunning and is made from heavy paper just like you would expect from a quality card you would send to friends. On the inside the card is completely blank, leaving lots of space to write Doctor Who about all your adventures. On the back you can find a Redbubble logo and design info in a 1-cm space on the bottom. And yes, this card came with an envelope (white one) so that it’s ready to mail. One thing I noticed on both cards is that they are pretty susceptible to fingerprints. Ff course it doesn’t help when you have a dark design like this and you should not notice it as much on a lighter design. If you like to shop for cards then pay attention, as often Redbubble offers a discount if you buy more cards (not limited to one design). As of this writing, they will give you 20% off if you buy 8 or more cards. 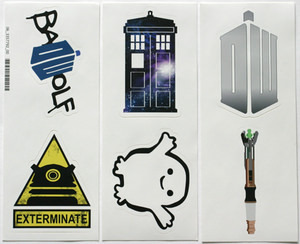 I ordered 6 Doctor Who themed stickers and even got an extra sticker – a Redbubble logo one (see top picture). When you order 6 or more stickers they offer you 50% off which really makes it fun to add a couple more. The stickers from Redbubble came on strips of two stickers and they are about 3.75 x 2.75 inch. Size is something that I would prefer to see more visible on the Redbubble site, as now you have to go into the sticker info tab to find out. And to be honest these stickers are kinda big, especially the Doctor Who logo one is much bigger than I hoped (can’t blame Redbubble as they stated it in their info). The stickers are made from a thick vinyl which is much thicker than a “normal” sticker but also makes it feel solid. Apparently they are waterproof and last outside for up to 18 months but I didn’t test that. Redbubble also says they are easy to remove but I didn’t want to ruin my sticker to see if that was true. 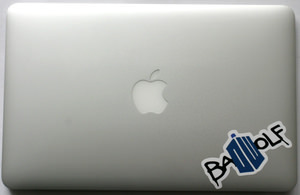 Above you can see the Bad Wolf sticker when I put it on my 11″ Macbook Air. The fun part is that the stickers are die cut which works out really nice with the Bad Wolf sticker and on the laptop you get a bit more feel for how big the sticker is. I really like the stickers Redbubble offers – they feel solid and look great. I still have 5 to use and may get some different themed stickers for the rest of my laptop. I am happy that Redbubble asked me to review their products. All the products I reviewed today are high quality that will last and that is important to me. OK maybe you can find cheaper stuff but if you want it to last then this is the way to go. The fun thing at Redbubble is also that many of the designs are available on different products. Like the Clara postcard also comes as poster. And the Bad Wolf sticker is also available as a card, t-shirt, and even as a case for your phone or iPad. Designs at Redbubble are also not limited to Doctor Who – you can get all kinds of stuff. If you want a t-shirt with a black dog then they will have it, or maybe you want an iPhone case with a picture of a pink Ford car then no problem it’s there. Ordering was a breeze although I could easily have ordered 10 times as much stuff if I wasn’t limited to the $50. It seems that Redbubble has different manufacturing plants for different products as I got 3 shipments, all from different places. Shipping goes quick – the stickers and cards were shipped the next day and the t-shirt a day after that. All in all Redbubble was flawless and it’s not that they knew that this order was for a review. I used my own name and a gift card and shipped it to my home. So if you like amazing Doctor Who stuff you should check out Redbubble. We at Shop Doctor Who write often about Redbubble products without mentioning who sells them, so maybe have a look at some Redbubble Products We Wrote About. We talked about many products and maybe you want one. You can click on all the pictures to bring you to products we talked about, and the text also has links in it. If the Doctor Who product you want is not in there then let me know and I will send you a link. We will be adding all these products to the site so that you can read about them separately but not as a review.